Quiet travel fan takes up very little room yet enables you to cool down during your walking, exercising, camping etc. Powerful fan provides quiet cooling indoors or outdoor with either USB or AA battery power supply. Compact, foldable fan with multi angles adjustable to enable you cool down wherever and whenever. 4*AA battery (not included) operated fans / USB power supply desktop fan. Round shape folds down to fit easily in a travel or book bag and weighs only 350g. Every sale includes an 12-month, worry-free guarantee to prove the importance we set on quality. If any issues arise, we will happily send a replacement on us. 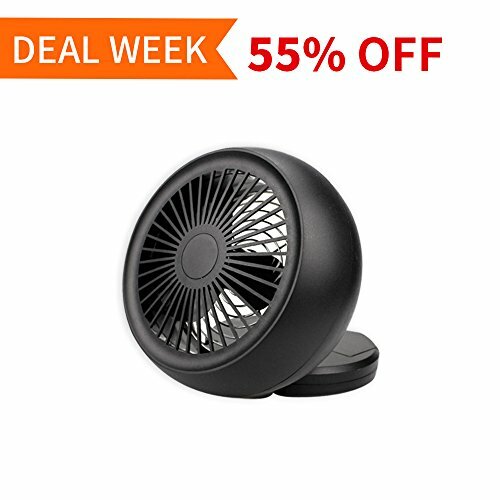 ✔ MINI FAN - 5-inch size and lightweight with powerful airflow provides you a comfortable experience wherever you need to cool down. ✔ LOWER NOISE - Ultra quiet fan, the motor of the desktop fan is made by DC brushless technique, will not disturb others whether at home or in the class when working or studying. ✔ ANGLE ADJUSTABLE - The fashion designed fan can be adjusted from 0°, 45°, 85° vertically to makes it easier for people to get the airflow from different angles. ✔ DUAL POWER SUPPLY - With the USB charging cable, the fan works with USB charger, laptop, computer, power bank and other USB-enabled devices. It also works with 4XAA batteries to give you dual choice, which could let you use it anywhere. ✔ 100% SATISFACTION GUARANTEED - We want you to feel confident in buying our products, so we are happy to offer full technical support on all our devices and a one-year replacement on defective products. If at any time you are not satisfied with your purchase, please contact us! We would be happy to assist you. Click " Add to Cart " to buy it now! If you have any questions about this product by WolfArya, contact us by completing and submitting the form below. If you are looking for a specif part number, please include it with your message.